* К специальной категории относятся: Apparel, Watches & Jewelry, Health & Beauty, Hair Extensions & Wigs, iPhone Cases. ** Заказы из категории market place, dropshipping (С одного аккаунта была совершена отправка заказов на 4 или более адресов в течение 90 дней) и wholesale (покупка более 10 продуктов (в одном или нескольких заказах) из категорий Cell phones, TV Box, RC Quadcopters, Robot Vacuum, Action Cameras, Tablet PCs, 3D Printers, 3D Printer Kits, Air Purifier, Projectors, Laptops, Scooters and Wheels в течение 12 месяцев) составляет малую часть всех заказов магазина. Определить, к какому магазину принадлежит товар вы можете на карточке справа. Список магазинов будет обновляться каждый вторник и четверг в описании программы. Будьте внимательны! Также обращаем ваше внимаение, что заказы с оптового сайта wholesale.gearbest.com не оплачиваются! GearBest.com это больше, чем просто интернет-магазин покупок. Он создан любителями гаджетов для любителей гаджетов. В интернет-магазине GearBest.com вы всегда сможете найти все виды крутых и популярных гаджетов, таких как: смартфоны, автомобили на пульте управления, радиоуправляемые квадрокоптеры, уникальные фонари, новейшие часы и другие электронные приспособления. Цены на нашу продукцию самые низкие ВО ВСЕМ МИРЕ! Если вы встретите где-то цену ниже, свяжитесь с нами и в течение 48 часов мы рассмотрим претензию и предоставим вам скидку на выбранный товар. 1. 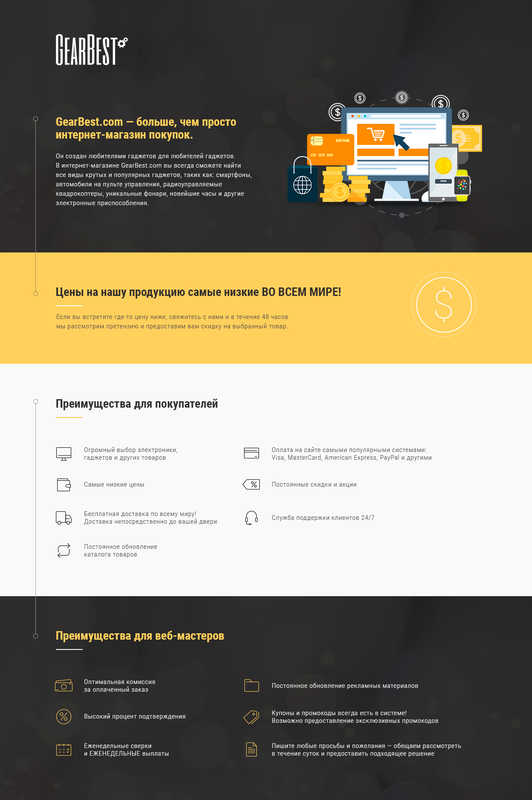 Мы не платформа для разных продавцов, мы один продавец. Это означает, что мы в ответственности за наш продукт, и вам не придется искать продавца в случае возникновения вопросов после приобретения товара. Мы всегда готовы вам помочь! 2. Gearbest дорожит своей репутацией и каждым клиентом. Мы всегда рады вашим отзывам, которые помогают нам улучшать сервис. 3. Качество – это наш слоган. Мы начинаем продавать товар только после прохождения контроля качества. 4. Мы постоянно предлагаем огромное количество бонусных программ, призов и бонусов, товаров на обзоры, повышение ставок, эксклюзивных купонов. 5. Мы регулярно проводим масштабные распродажи. День рождение русской версии сайта 6 июня. И также постоянные flash sale и ежедневные купоны, которые вы можете запросить у своего менеджера или через тикеты. Нельзя создавать группы в социальных сетях, состоящие только из: gearbest, gearbest.com, gearbestcom, gear best. Заказы, совершенные самими вебмастерами по их реферальной ссылке, будут отклонены. YOU MAY NOT USE ANY TOOLS OR OTHER TECHINCAL METHOD TO HIJACK THE IP ADDRESS, FILLING YOUR COOKIE IN SITES WHICH NOT BELONS TO YOU OR REPLACE THE COOKIE OF OTHER AFFILIATES. 1. Once detected, we’ll inform you and withhold all of your commissions( during the period when you’re doing TM+ Bidding or Cookie Stuffing). You should adjusting your list soon and notify us when changes occur within one business day. 2. If it comes to our attention that you’re breaking the rules for the second time, we’ll withhold all of your commissions during these period, request a refund of the paid placements and terminate the relationship with your site. PS: If you don't reply to GearBest at the first time, we’ll directly take the action of the Measure No.2. The GearBest Affiliates are not allowed to include GearBest or Suppliers’ Trademarks (like "gearbest", "gear-best", “xiaomi”)or variations or misspellings thereof in their domain names of the website or other promoting channels (like facebook, whatsapp, telegram or other SNS). Affiliates are also not allowed to use the LOGO of GearBest or GearBest’s Suppliers in their profile pics or as their own LOGO. P.S: you may check all the suppliers of GearBest here: https://www.gearbest.com/top-brands/index.html. Once you violate the terms & policy, GearBest will be forced to withhold all the commissions, terminate this relationship and reserves the right to take legal action in such instances. This Gearbest.com Operating Agreement for Affiliate Program, including all exhibits and attachments, contains the complete terms and conditions that apply to a party's participation as an affiliate in the Affiliate Network of Gearbest.com (the "Program"). As used in this Agreement, "we", "us" means Gearbest.com, and "you" means the applicant party. "Site" means a World Wide Web site and, depending on the context, refers either to the Gearbest.com Site or to the portion of the Gearbest.com Site that you will link to using Qualifying Links (as defined in Section 2). You may submit a completed Program application to begin the enrollment process ("Application"). Submission of your Application to the Gearbest.com Affiliate Program implies acceptance to the terms set forth in this Agreement. We will evaluate your Application and notify you of your acceptance or rejection. We may reject your Application if, in our sole discretion, we determine for any reason that your website is unsuitable for the Program. Affiliates from Cuba, Iran, North Korea, Sudan, Syria, Crimea(Ukraine) are not eligible to enroll in the Program. Gearbest suppliers and re-sellers are not eligible to enroll in the Program. - Provide a portion of their Referral Fees (as defined in Section 5) to websites or organizations that would violate any of the above criteria. In addition, Gearbest.com may, at its discretion, decline to accept, require adherence to an additional set of terms and conditions, or require the posting of specific copy for any website that (1) donates, directs or transfers any portion of their Referral Fees or affiliate benefits to any charitable website, education-related website, organization or program; or (2) provides rewards back to their members in the form of points or cash-back, or conduct other similar loyalty programs in connection with purchases made by members via their websites. Regardless of your acceptance in the Program, we may terminate this Agreement for any reason, at any time. The terms of our acceptance criteria are subject to change at any time without prior notice. All decisions for acceptance into the Program will be made within our sole discretion. If your Application is not accepted, you may reapply to the Program at any time; however, you should not and may not link to our Site unless you are approved for the Program. Upon acceptance into the Program, we will make available to you Qualifying Links that are subject to the terms and conditions of this Agreement. A "Qualifying Link" is a link from a website to our Site using one of the Universal Record Locators ("URLs") or graphic links provided by Gearbest.com, The Gearbest Affiliate program or by other means selected by us for use in the Program. All Qualifying Links must link directly and exclusively to Gearbest.com. Gearbest.com must approve each and every website that links to our Site through a Qualifying Link. If you use a Qualifying Link to link a website to our Site without seeking explicit authorization, your continued use of that Qualifying Link shall be considered a breach of this Agreement. However, continued use of the Qualifying Link will nonetheless subject such websites to the Terms and Conditions of this Agreement. The Qualifying Links will serve to identify you website as a member of the Program and will establish a link from a website to our Site. All Qualifying Links that you will use in the Program will be provided to you from The Gearbest Affiliate program or by other means selected by us. You also agree that you will display on the website containing the Qualifying Link only those logos, trade names, trademarks, graphic images and similar identifying material ("Licensed Materials") that are provided by us or by the Gearbest Affiliate program, and you will substitute such images with any new materials provided by us or the Gearbest Affiliate program from time to time throughout the term of this Agreement. A web widget that is pre-approved in writing by Gearbest.com for use on your website may be considered a Qualifying Link for purposes of this Agreement. Accordingly, web widgets are subject to all of the Terms and Conditions of this Agreement that apply to Qualifying Links. Only valid Qualifying Links will be tracked for purposes of determining Referral Fees that you may be eligible to receive on sales of Qualifying Products (as defined below) generated through your participation in the Program. Only Qualifying Links may be used to link a website to areas within our Site. You may not link directly to Gearbest.com without use of a Qualifying Link. You may post as many Qualifying Links to our Site as you like on a website, provided that you ensure that each website containing a Qualifying Link posted by you meets the terms of this Agreement, including without limitation, that such website does not fall into the "unsuitable website" category described in Section 1, does not fall into the "prohibitions" set forth in Section 3, and you take responsibility for all websites on which you post a Qualifying Link in accordance with Section 10. The position, prominence and nature of links on a website shall comply with any requirements specified in this Agreement but otherwise will be in your discretion. You understand and acknowledge that this Agreement is made between you and Gearbest.com and is solely for the purpose of allowing you to link to the Gearbest.com Site. - use any illegal SEO methods (Black hat SEO), such as Paid links, Clocking.cloaked page, Keyword stuffing, Doorway pages, Invisible text, Article spinning, Duplicate content, Spam comments. - generate or send any unsolicited Electronic Communication (spam) under this Agreement. - use the Trademarks in any manner not expressly authorized by this Agreement. - bid on our Trademarks at any website that provides search engine services and that results in driving traffic to any website, other than our Site, including your website. In addition, you are bound to act in compliance with all applicable federal, state and local laws and regulations, including without limitation, the CAN-SPAM Act of 2003 ("CAN-SPAM"). We will be responsible for all aspects of order processing and fulfillment of orders placed by customers who follow your Qualifying Links to the Gearbest.com Site in accordance with applicable legal requirements. We reserve the right to reject orders that do not comply with any reasonable requirements that we periodically may establish. Among other things, we will prepare orders forms; process payments, cancellations, and returns; and handle customer service. Through the Gearbest Affiliate program, you have the ability to track sales made to customers who purchase products using your Qualifying Links and you can review reports summarizing this sales activity. To permit accurate tracking, reporting, and fee accrual, you must ensure that your Qualifying Links are properly formatted. The form, content, and frequency of the reports are limited to those reports and capabilities available through The Gearbest Affiliate program and may vary from time to time in our and/or The Gearbest Affiliate program’s reasonable discretion. Gearbest.com is not responsible for any changes that The Gearbest Affiliate program’s format, timing, or types of reports available to members of The Gearbest Affiliate program and Gearbest.com's Affiliates. Gearbest.com will not be responsible for improperly formatted links regardless of whether you have made amendments to the code or not. In addition, we are unable to track or provide credit for sales from customers that are referred to us with browsers that do not have their cookies setting enabled. - remit full payment to us. We will pay, to Gearbest Affiliate program for ultimate payment to you, Referral Fees on products that are actually purchased by a customer within thirty (30) days after the customer has initially entered our Site ("Referral Fee Time") as long as the customer reenters our Site directly during that time (and not through another affiliate link). We will not pay Referral Fees on any products are purchased on our Site when a customer has re-entered our Site (other than through a Qualifying Link from your website) after the Referral Fee Time, even if the customer previously followed a link from your website to our Site. Customer Service invoice adjustments and reorders are not eligible to earn Referral Fees. Products that are entitled to earn Referral Fees under the rules set forth above are hereinafter referred to as "Qualifying Products". You will earn Referral Fees based on the sale price of Qualifying Products (as defined above), according to fee schedules to be established by us. "Sale price" means the sale price listed on our Site and excludes costs for shipping, insurance, tracking, handling, gift-wrapping, rebates, refunds, returns, chargebacks, cancellations and taxes. The current Referral Fee Schedule is available to you through the affiliate portal available to all members of the Program ("Affiliate Portal"). Because of the volume and breadth of items that we carry on our Site and our practice of continuing to add new items over time, certain items may not be listed in the Referral Fee database at the time purchases are made through your website. In addition, we reserve the absolute right and discretion to exclude items from our Referral Fee database. Therefore, you acknowledge and agree that we cannot and do not warrant or guarantee that you will be paid a referral fee on any item(s) or that all items eligible for a referral fee will be paid in accordance with the Referral Fee Rates listed on the Affiliate Portal. You acknowledge that in such circumstances, you will accept the Referral Fee Rates and payouts actually paid to you. We reserve the right, at our sole discretion, to change, modify, add or remove portions of this Referral Fee Schedule, at any time. If you have any questions concerning whether a certain item is eligible for a referral fee, please contact us. Approximately 60 days following the end of each calendar month, you will receive a check for the Referral Fees earned on products that were shipped during that month, less any taxes that we or Gearbest Affiliate Network are required by law to withhold from the final payment to you. If a customer returns a product that generated a Referral Fee, you will see a deduction for the corresponding Referral Fee from your next monthly payment; if there is no subsequent payment, you will receive an invoice for the Referral Fee payable within sixty (60) days of your receipt of the invoice. 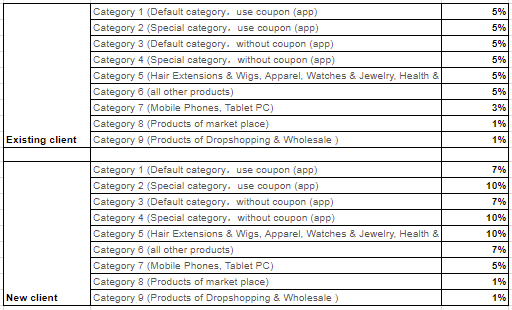 All determinations of Qualifying Links and whether a Referral Fee is payable will be made by The Gearbest Affiliate program and/or Gearbest.com and will be final and binding. Customers who buy products through this Program will be deemed to be customers of Gearbest.com without affecting their status as your customer. Accordingly, all Gearbest.com rules, policies, and operating procedures concerning customer orders, customer service, and product sales will apply to those customers with respect to their transactions at Gearbest.com. We may change our policies and operating procedures at any time consistent with applicable laws. For example, we will determine the prices to be charged for products sold under this Program in accordance with our own pricing policies. Product prices and availability may vary from time to time. You may include current price information in your product descriptions only if such information is provided to you by Gearbest.com, provided that any price information must be accompanied with a statement on your website indicating to the user that in the event of any price difference between your website and Gearbest.com, the price listed on Gearbest.com will govern. We will use commercially reasonable efforts to present current and accurate information, but we cannot guarantee the availability or price of any particular product. We grant you a limited, nonexclusive, nontransferable, revocable right to access our Site through the Qualifying Links solely in accordance with the terms of this Agreement and solely in connection with the Licensed Materials (as defined in Section 2), only as provided to you by us, through The Gearbest Affiliate Network, or by other means selected by us, and solely for the purpose of identifying your website as a Program participant and to assist in generating the sale of Gearbest.com products. You acknowledge that this Agreement does not provide you with any intellectual property rights in the Licensed Materials other than the limited rights contained herein. We reserve all of our rights in the Licensed Materials and of our other proprietary rights. You may not sublicense, assign or transfer any such licenses for the use of the Licensed Materials, and any attempt at such sublicense, assignment or transfer is void. We may terminate your license to use the Licensed Materials for any reason at any time in our sole and absolute discretion. You agree to follow our Trademark Requirements in Exhibit A, as those may change from time to time. We may revoke your license at any time by giving you written notice. - notifying us and The Gearbest Affiliate program of any malfunctioning of the Qualifying Links or other problems with your participation in the Program in accordance with the terms of this Agreement. We disclaim all liability for these matters. Further, you will indemnify and hold us harmless from all claims, damages, and expenses (including, without limitation, attorneys' fees) relating to the development, operation, maintenance, and contents of your website. The term of this Agreement will begin upon our acceptance of your Application and will end when terminated by either party. You may terminate this Agreement at any time, with or without cause. We may terminate this Agreement immediately at any time, with or without cause. Upon termination, all Gearbest.com related content and links shall be promptly removed from your website. You are only eligible to earn Referral Fees on sales of Qualifying Products occurring during the term, and fees earned through the date of termination will remain payable only if the related orders are not canceled or returned. In the event overpayment is made by us, you agree to promptly remit such excess payment upon notification by us. We may withhold your final payment for a reasonable time to ensure that the correct amount is paid. We may modify any of the terms and conditions contained in this Agreement, at any time and in our sole discretion. We will also make commercially reasonable efforts to notify you of such changes prior to or upon implementation. Modifications may include, for example, changes in the scope of available Referral Fees, Referral Fee Schedules, payment procedures, and Program rules. IF ANY MODIFICATION IS UNACCEPTABLE TO YOU, YOUR ONLY RECOURSE IS TO TERMINATE THIS AGREEMENT. YOUR CONTINUED PARTICIPATION IN THE PROGRAM FOLLOWING OUR POSTING OF A CHANGE NOTICE OR NEW AGREEMENT ON OUR SITE AND/OR SENDING YOU THE CHANGE NOTICE WILL CONSTITUTE BINDING ACCEPTANCE OF THE CHANGE. You and we are independent contractors, and nothing in this Agreement will create any partnership, joint venture, agency, franchise, sales representative, or employment relationship between the parties. You will have no authority to make or accept any offers or representations on our behalf. You will not make any statement, whether on your website or otherwise, that reasonably would contradict anything in this Section. You acknowledge that by entering into and performing its obligations under this Agreement, we do not assume and should not be exposed to the business and operational risks associated with your business, or any aspects of the operation or content of your website(s). Accordingly, in addition to any other indemnification obligations contained in this Agreement, you shall protect, defend, hold harmless and indemnify us from and against any and all claims, actions, liabilities, losses, costs and expenses, even if such claims are groundless, fraudulent or false (including court costs and reasonable attorneys' fees) incurred as a result of claims of customers or other third parties against us and our affiliates, licensors, suppliers, officers, directors, employees and agents arising from or connected with any of the content or activities of your website (including without limitation any activities or aspects thereof or commerce conducted thereon) or related business, or your misuse, unauthorized modification or unauthorized use of the services or materials provided by us hereunder. We make no express or implied warranties or representations with respect to the Program or any products sold through the Program (including, without limitation, warranties of fitness, merchantability, non-infringement, or any implied warranties arising out of a course of performance, dealing, or trade usage). In addition, we make no representation that the operation of our Site will be uninterrupted or error-free, and we will not be liable for the consequences of any interruptions or errors; however, we will make commercially reasonable efforts to correct errors or interruptions promptly. YOU ACKNOWLEDGE THAT YOU HAVE READ THIS AGREEMENT AND AGREE TO ALL ITS TERMS AND CONDITIONS. YOU UNDERSTAND THAT WE MAY AT ANY TIME (DIRECTLY OR INDIRECTLY) SOLICIT CUSTOMER REFERRALS ON TERMS THAT MAY DIFFER FROM THOSE CONTAINED IN THIS AGREEMENT OR OPERATE WEB SITES THAT ARE SIMILAR TO OR COMPETE WITH YOUR WEB SITE. YOU HAVE INDEPENDENTLY EVALUATED THE DESIRABILITY OF PARTICIPATING IN THE PROGRAM AND ARE NOT RELYING ON ANY REPRESENTATIONS, GUARANTEE, OR STATEMENT OTHER THAN AS SET FORTH IN THIS AGREEMENT. This Agreement will be governed by and construed in accordance with the laws of Hong Kong, without regard to or application of conflicts of law rules or principles. Any dispute, controversy, or claim shall be resolved through negotiation to the extent possible. In the event the Parties fail to resolve any dispute arising hereunder through negotiation, each party shall submit to the exclusive jurisdiction of the courts of Hong Kong. You shall not create, publish, distribute, make or permit any public announcement of this Agreement or the relationship contemplated hereunder, (including, but not limited to, any press release, client list, screen shot, advertisement or any promotional material) without first submitting such material to us and receiving our written approval, which we may withhold in our sole discretion. Except as otherwise provided in this Agreement or with our prior written consent, you agree that all information including, without limitation, the terms of this Agreement, our business and financial information, our customer lists and purchase history, and our pricing and sales information, shall remain strictly confidential and shall not be utilized, directly or indirectly, by you for your own business purposes or for any other purpose except and solely to the extent that any such information is generally known or available to the public through a source or sources other than you or your affiliates. Notwithstanding the foregoing, you may deliver a copy of any such information (a) pursuant to a subpoena issued by any court or administrative agency, (b) to your accountants, attorneys, or other agents on a confidential basis, and (c) otherwise as required by applicable law, rule, regulation or legal process, upon written notification to Gearbest.com. Violation of any of the terms or prohibitions contained in this Agreement may result in, among other things, (a) the immediate termination of this Agreement; (b) the withholding of Referral Fees due to you; or (c) the commencement of an action by Gearbest.com against you seeking, without limitation, injunctive relief, recovery of actual, statutory or punitive damages. We have the right in our sole and absolute discretion to monitor your website at any time and from time to time to determine if you are in compliance with the terms of this Agreement, and you agree to provide us with unrestricted access to your website for such purpose. These requirements apply to your use of Gearbest.com (the "Trademarks") in content that has been approved by us. 1. You may use the Trademarks only for purposes expressly authorized by us. 2. You may not modify the Trademarks in any manner. For example, you may not change the proportion, color, or font of the Trademarks. 3. You may not display the Trademarks in any manner that implies endorsement of your website or business by Gearbest.com outside of your involvement in the Program. 4. You may not use the Trademarks to disparage Gearbest.com, its products or services, or in a manner which, in our reasonable judgment, may diminish or otherwise damage our good will in the Trademarks. 5. Each Trademark must appear by itself, with reasonable spacing (at least the height of the Trademark) between each side of the Trademark and any other graphic or textual image. You may place the Gearbest.com name or logo adjacent to competitive brands, subject to the requirements of this Agreement, including prohibitions against objectionable material and websites. 6. You acknowledge that all rights to the Trademarks are our exclusive property and all goodwill generated through your use of the Trademarks will inure to our benefit. 7. YOU MAY NOT USE THE TRADEMARKED NAME, GEARBEST, GEARBEST.COM, OR ANY VARIATIONS OR MISSPELLINGS THEREOF, IN ANY MANNER INCLUDING KEYWORD BIDDING ON SEARCH ENGINES; YOU MAY NOT USE GEARBEST, GEARBEST.COM, OR ANY VARIATION OR MISSPELLINGS THEREOF, IN METATAGS OR TO DIRECT TRAFFIC TO ANY WEBSITE OTHER THAN OUR SITE; YOU MAY NOT USE GEARBEST, GEARBEST.COM, OR ANY VARIATIONS OR MISSPELLINGS THEREOF, IN HIDDEN TEXT OR SOURCE CODE ; YOU MAY NOT USE GEARBEST, GEARBEST.COM, OR ANY VARIATIONS OR MISPELLINGS THEREOF, IN YOUR DOMAIN NAME OR ANY OTHER PART OF YOUR UNIVERSAL RECORD LOCATOR. 8. You may not bid on any keyword or on any Pay per Click Search Engines (PPCSEs) where such keyword is one of our Trademarks or any variation or misspelling of one of our Trademarks (see the non-exclusive list of examples set forth below in Section 15). You may not bid on any word or term that is confusingly similar to any of our Trademarks standing alone. Further, you may not bid on keyword strings that incorporate our Trademarks (e.g., "Gearbest.com Electronics", "Gearbest coupon"). 9. You may not employ any "fat finger" domains or typosquatters redirecting web traffic to your website. A typosquatter for "fat finger" domain is any domain that amounts to misspellings of any registered or unregistered Trademarks. 10. You may not bid on any keyword or on any PPCSEs that is one of our competitors' trademarks (or a derivation of a competitor's trademark), or any other word or term that is likely to cause confusion regarding its affiliation with the competitor. Examples of these keywords include, but are not limited to: "Banggood", "DX", "Lightinthebox", "Miniinthebox","Fasttech, "Geekbuying", "Tinydeal". 11. Gearbest.com may, in its sole discretion, terminate you or withhold payment of your Referral Fees for the days that we determine that you were bidding in violation of the keyword bidding requirements above. 12. The list below sets forth examples of impermissible keywords, "fat-finger" domains, and variations of Trademarks that you may not bid on. The list is for example purposes only and is not a complete list of prohibited words which infringe a Trademark, and therefore violate a term of this Agreement. We reserve the right in our sole discretion to modify these requirements at any time. These requirements apply to your use of the Program as a Network. A "Network" is defined as any affiliate that operates one or more websites as sub-affiliates through one (1) Application to the Program. 1. You agree to all the terms and conditions of this Agreement, including all attached Exhibits, on behalf of all sub-affiliates operating under the Network and are responsible for any action or inaction by such sub-affiliates. 2. You must seek prior written approval from Gearbest.com before choosing to operate as a Network. Such requests must be sent to Gearbest.com. 3. You must provide to Gearbest.com a list of all sub-affiliates working within your Network within twenty-four (24) hours of any request from Gearbest.com. 4. Any violation of this Agreement by any sub-affiliate may result in immediate termination of the entire Network from the Program.